Namibia is an ideal destination for exploring on foot and hiking the Sossusvlei dunes will take you into a unique and strange landscape. Sossusvlei is classic Namib Desert scenery with magnificent, apricot dunes sculpted by the wind and set against a cobalt blue sky. 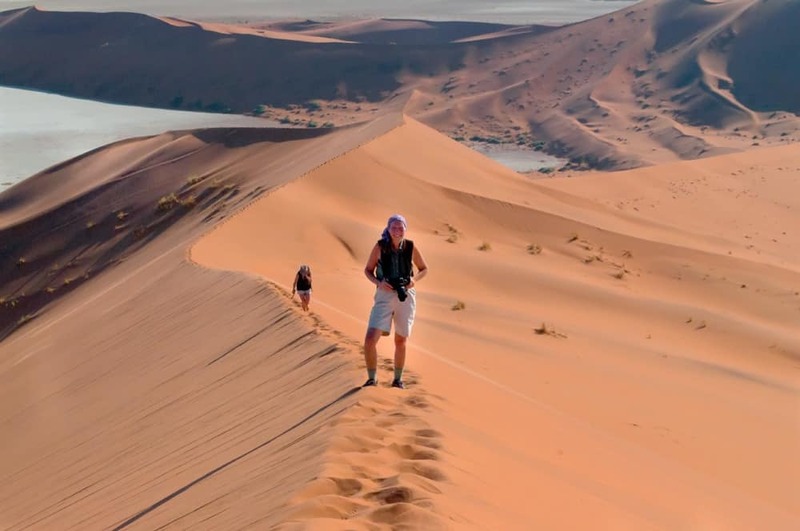 Hiking the Sossusvlei Dunes can be a surreal experience as you stand on atop the world’s highest sand dunes and savor the endless views across the Great Sand Sea. 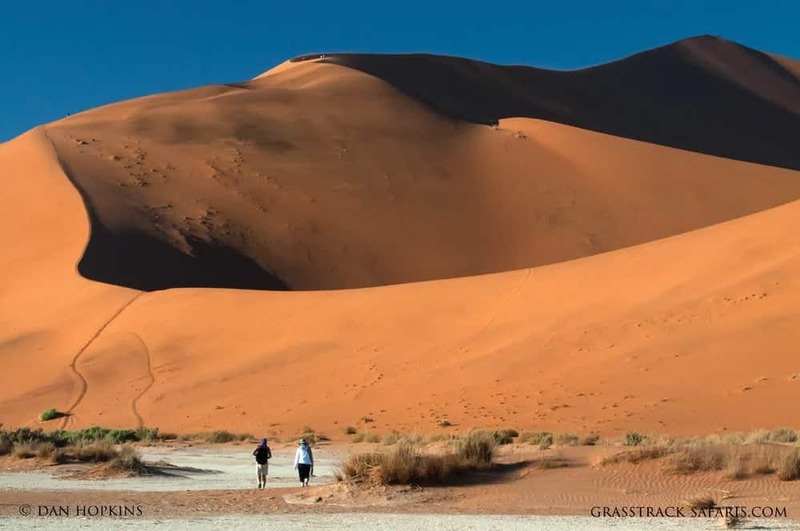 Here are a few suggestions if you’re interested in hiking the dune of Sossusvlei. This most frequently visited section of the massive 20,000 miles² Namib Naukluft National Park has become known as Sossusvlei, famous for its towering apricot colored sand dunes which can be reached by following the Tsauchab River valley. Sossusvlei itself is a clay pan set amidst these star shaped dunes which stand up to 900 feet above the surrounding plains, ranking them among the tallest dunes on earth. The deathly white clay pan contrasts against the orange sands and forms the endpoint of the ephemeral Tsauchab River, within the interior of the Great Sand Sea. The river course rises south of the Naukluft Mountains in the Great Escarpment. It penetrates the sand sea for some 35 miles before it finally peters out at Sossusvlei, about the same distance from the Atlantic Ocean. Until the encroaching dunes blocked its course around 60,000 years ago, the Tsauchab River once reached the sea. Sossusvlei is the biggest of four pans in the vicinity. Another, famous for its gnarled and ghostly camel thorn trees, is Deadvlei which can be reached on foot over a half mile of sand. 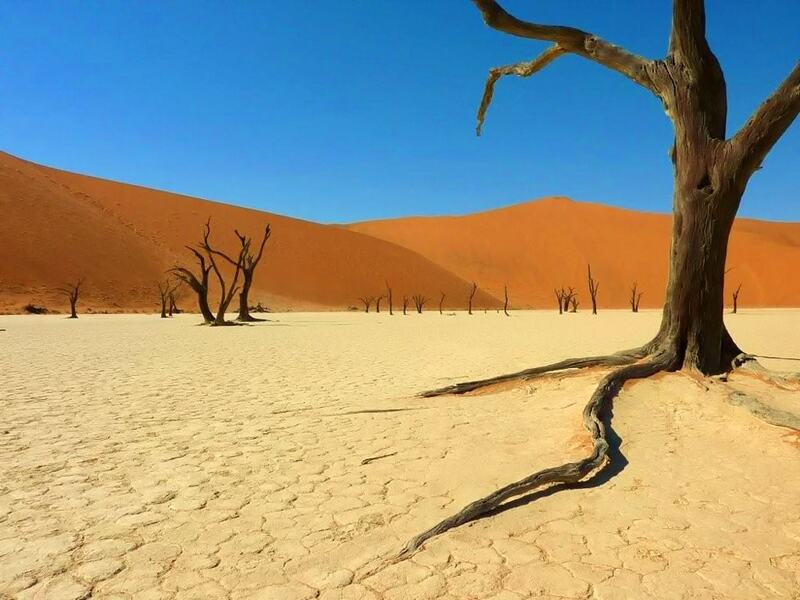 Deadvlei’s striking camel thorn trees, dead for want of water, still stand erect as they once grew. They survived until about 900 years ago when the sand sea finally blocked the river from occasionally flooding the pan. The approach to Sossusvlei is straightforward. At the park entrance gate in Sesriem, just follow the asphalt road for about 35 miles until it ends at a parking lot. This drive along the Tsauchab River valley is beautiful as the dune field gradually surrounds you. You could stop for a hike up Dune 45 but save your energy to explore around Sossusvlei. At the parking lot, the asphalt ends and you can walk or drive (4x4 only) the final 2 miles to Sossusvlei. Once you arrive at Sossusvlei itself the dunes are looming all around you. If you’re in good physical shape and an experienced hiker you can climb to the top of the largest dune, known as Big Daddy. There are no marked trails but the path is obvious-just start walking to the highest dune! Keep in mind the top is further than it looks and sections of the hike are steep. Once you start climbing the dunes you’ll be in heavy, loose sand (two steps up, one step down, and repeat). At a fairly quick pace the summit of Big Daddy is about a 1.5-hour hike. The views from the top are simply fantastic with the dunes of the Great Sand Sea stretching all the way to the Atlantic Ocean. Coming down is the best part. Follow the steep slip-face of the dune all the way to the base and you’ll be at Deadvlei in about 15 min. Wander among all the dead trees and back to the car. A second option is to leave your car and hike the smaller dune near Deadvlei. You’ll enjoy a little dune hiking with great views without the effort of climbing Big Daddy. From the top of this dune, hike down the slip-face to Deadvlei and back to your car. A third option is to hike directly to Deadvlei itself, without hiking up any of the dune. The trail is mostly flat with some sandy sections. From your car to Deadvlei will take about 35 minutes. Regardless of how you explore Sossusvlei be sure to bring plenty of water. It’s hot and the sun is fierce later in the day. If you’re hiking up any of the dunes you will sweat and need to drink plenty of water. A wide-brimmed hat, sunglasses, sunscreen, and sturdy boots are a must. This 10 day safari includes lodge accommodation throughout your journey. 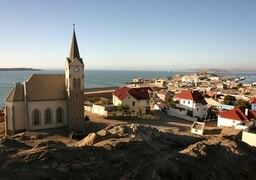 Visit Sossusvlei, Damaraland, and Etosha National Park. Learn more here. 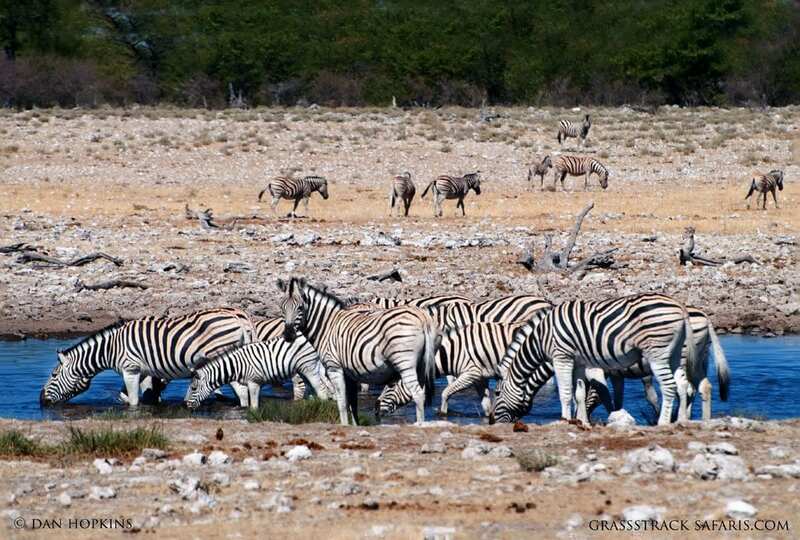 This 14 day camping safari (or upgrade to lodge accommodation) includes visits to southern Namibia, Sossusvlei, Damaraland, and Etosha National Park. Learn more here. 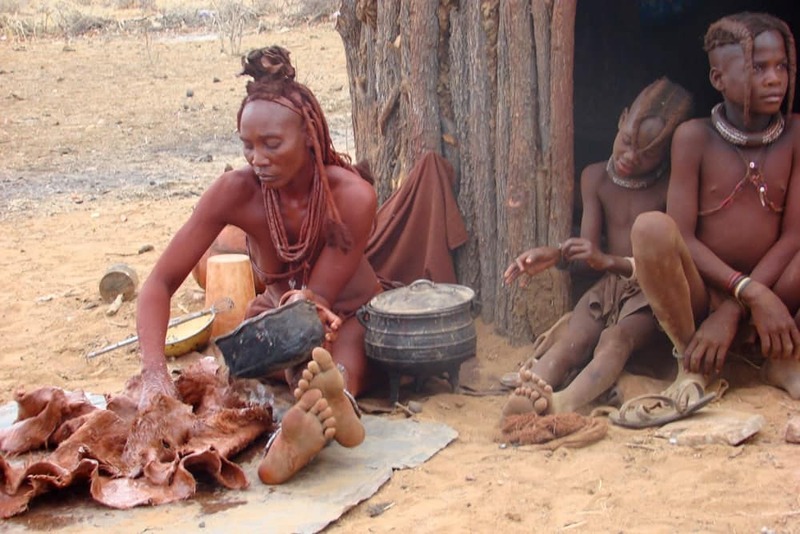 This 10 day camping safari (or upgrade to lodge accommodation) visits Sossusvlei, Damaraland, and Etosha National Park. Learn more here.